PinShareTweetRedditBuffer78K Shares Do you dread that time of year when you sun the comes out and you finally see all of the dust that coats your home? It’s almost Spring Cleaning time! Finally.. My house will be clean. Please note that *This page might contain affiliate links. Read the disclosure policy here. 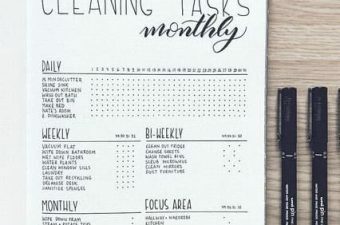 I’ve got … Continue reading The Best Bullet Journal Ideas To Crush Your Chore List!